What is red clover? What is it used for? Red clover is a perennial herb that grows up to 18 inches in height. Native to Europe, central Asia and northern Africa, it is now found in many other parts of the world. The plant derives its name in part from its flowers, which are fragrant and can range in color from white to a dark, fleshy red. Both fresh and dried flower heads can be used medicinally. Red clover flowers contain a number of substances believed to facilitate healing, including a volatile oil and isoflavones. In traditional Chinese medicine, red clover is believed to help clean the blood, clear heat and remove toxins. Internally, red clover is used as an alternative medicine for hot flashes that occur during menopause; skin complaints such as eczema and psoriasis; chronic degenerative diseases; gout; whooping cough; and dry coughs. Research is currently being conducted on slaframine, an alkaloid found in diseased versions of red clover, which may be used to fight diabetes. In addition, many of the isoflavones contained in red clover have demonstrated antitumor activity. However, this does not mean that red clover can successfully treat cancer, as some have claimed. How much red clover should I take? 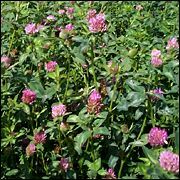 The recommended daily dosage of red clover is four grams of dried flower heads, added to water and taken as an infusion up to three times daily. Alternatively, some practitioners recommend 1.5-3ml of a liquid extract up to three times per day. What forms of red clover are available? Red clover is available in powder and liquid extract forms. The powder is often used in infusions and elixirs. What can happen if I take too much red clover? Are there any interactions I should be aware of? What precautions should I take? When taken in the recommended therapeutic dosages, there are no known side-effects or drug interactions associated with red clover. Howes JB, Sullivan D, Lai N, et al. The effects of dietary supplementation with isoflavones from red clover on the lipoprotein profiles of post-menopausal women with mild to moderate hypercholesterolaemia. Atherosclerosis 2000;152:143-147. Leung AY, Foster S. Encyclopedia of Common Natural Ingredients Used in Food, Drugs and Cosmetics, 2nd ed. New York: John Wiley & Sons, 1996, pp. 177-8. Nestel PJ, Pomery S, Kay S, et al. Isoflavones from red clover improve systemic arterial compliance but not plasma lipids in menopausal women. J Clin Endocrinol Metab 1999;84:895-8. Wagner H, Wiesenauer M. Phytotherapie. Phytopharmaka und Pflanziche Homopathika. Stuttgart: Fischer-Verlag, 1995. Yanagihara K, Ito A, Toge T, et al. Antiproliferative effects of isoflavones on human cancer cell lines established from the gastrointestinal tract. Cancer Res 1993;53:5815-5821.